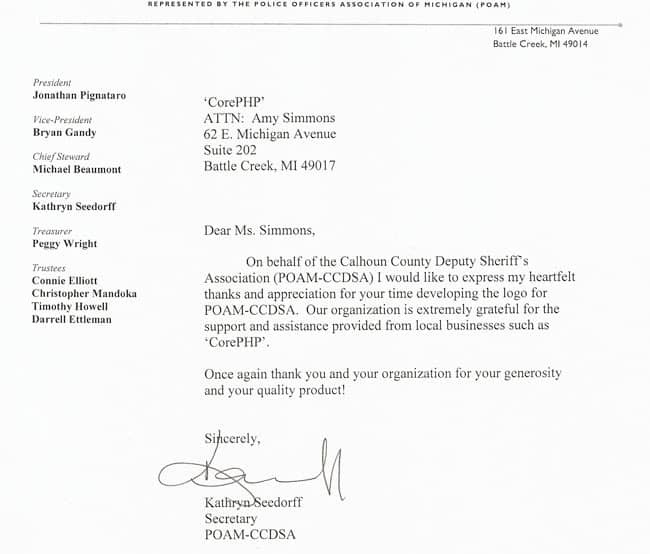 Several months ago ‘corePHP’ was approached by Calhoun County Deputy Sheriff’s Association (POM-CCDSA) to help with the re-branding of their organization. They needed a new logo that will help identify them and their new mission. Amy Simmons here at ‘corePHP’ took on the task and it was a complete success with the members at the union. ‘corePHP’ just received a letter of appreciation and we are super excited to share that and the new logo that was designed. We pride ourselves to give back to our community. As you know police officers give up a lot from family time to taking on the dangerous unknowns from the job to protect the community. It was our pleasure to give back to those that protect us on a daily basis. Amy went above and beyond in designing a logo that fits who they are. Here at ‘corePHP’ we specialize in the re-branding of organizations and companies. Hope you enjoy the new logo that will be part of the POAM-CCDSA for a very long time! Thank you to the POAM-CCDSA for letting us be part of this great project. This entry was posted in Uncategorized on April 18, 2011 by The Core Team.